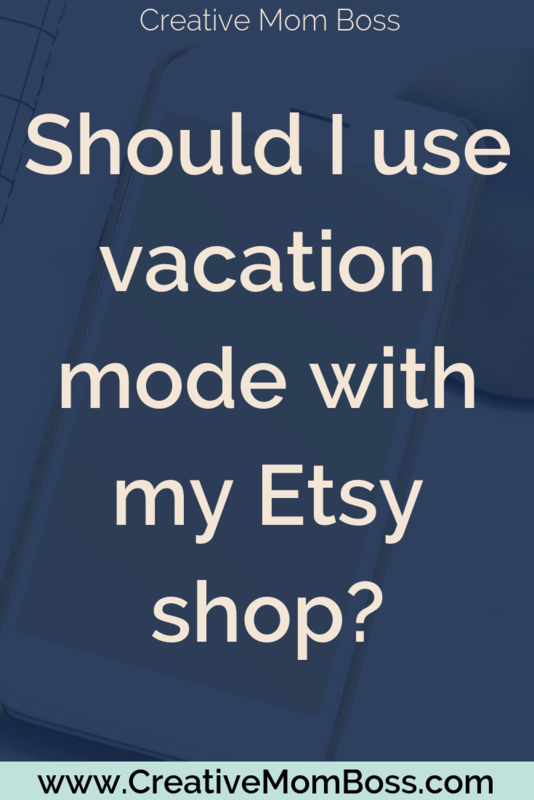 if I need to take a break, or I'm going on vacation, should I use vacation mode in my shop? This is something that people have debated for years, with a whole lot of sellers saying that using vacation mode has no impact on the future sales of their business, and then a whole other group of sellers saying that they used vacation mode and they saw a long-lasting and very dramatic impact on their sales in the shop. I think that either one of these scenarios can be true when you use vacation mode, and a lot of it depends on where are you are in the building of your shop and how consistent your sales are before you go on vacation mode, and then also what you consider to be good sales. I think it also depends on how long you go on vacation mode and what the scenario is surrounding it. If you're only leaving for a few days or a week for vacation, it's different than taking a year off of your business. 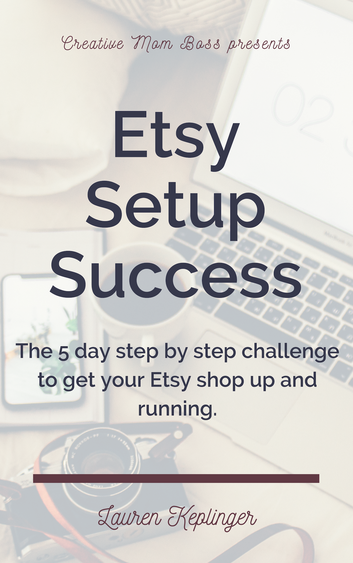 Formally Etsy has said that vacation mode does not impact your shop directly in the way that it is ranked for SEO, however in the time that you are in vacation mode your shop is not gaining traction in its relevancy and quality score. Meanwhile other shops in your niche selling similar things are gaining traction, getting more sales, getting more favorites, and increasing their quality score. So it's not necessarily that your shop goes down it's that other shops go up and therefore yours is lower in comparison. Anecdotally from my own experience with a shop that gets steady and consistent sales, vacation mode had a long-lasting and dramatic impact on the amount of sales that I had. I have not used vacation mode since the end of 2015/early 2016 when I last went on maternity leave with my youngest child. 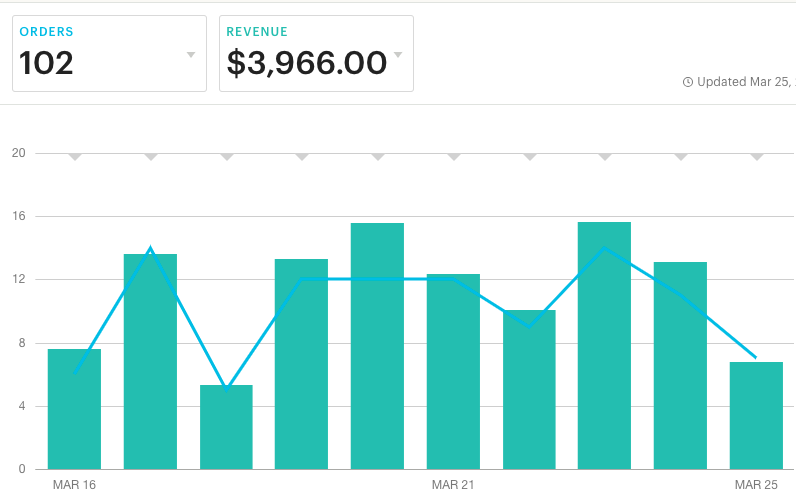 I wanted to show you a graph of my business prior to going on maternity leave, and then the results of vacation mode after I came back. As you can see from these graphs, my sales were impacted in a real and big way. It took about 5 months after reopening to get back to where I was before I took time off. However I also want to say that I was on maternity leave for over 6 months, so it's not the same as just taking a week-long vacation or taking a weekend off and not taking orders. I think that there are two scenarios where people often times use vacation mode, one of which I don't think is a bad thing and the other which I think you should avoid. If you are in a situation, like I was, where you are taking a large chunk of time off and you really don't want to have to worry about your shop or worry about people messaging you and asking questions during that time, I think vacation mode is a good choice. A new baby, an illness in the family, some sort of emergency where you need time off, these are all reasons that vacation mode would apply. However you just have to understand that there probably is going to be a lag once you open back up again before orders really start coming in in the way that they were before you went on vacation mode. The other time I think that people often contemplate using vacation mode or do use it is when they are going on an actual vacation. if you're going to be gone for only a week or two, I don't think there's any reason that you should use vacation mode. You're leaving money on the table for orders that would have been ready to be completed once you return, and while having time off sometimes is nice, if you are approaching your Etsy shop as a real business with a steady and consistent income, you are going to want to have a queue of orders that is there to keep you busy when you're available to work again. I have taken up to almost two weeks off before without going on vacation mode and instead just extending out the processing time of my orders in order to give myself some time once I returned to get things shipped. I update the announcement at the top of my shop, I update the message that sends out when people purchase, and I post on my social media channels or my community that I will not be taking any rush orders and orders will not be shipping until whatever date it is that I return from my vacation. This has always worked really well for me to allow me to have sales and income while I'm on vacation, but to have that time off that I can spend with my family and not have to be worried about making orders and shipping things out. Most of the time I do bring my computer when I go on vacation, so that I can answer convos here and there, however I'm not logging on every single day. Usually I will log on maybe once every three or four days to make sure that nobody has sent me anything that they are really upset about or is really urgent, but for the most part I do take that time to disconnect. You guys know that I like tangible examples, so I wanted to talk about my most recent vacation that I went on with my family for spring break. I was gone from March 16th until March 25, so 9 days away on vacation. My typical turnaround in my shop can range from 3-5 business days to 1-2 weeks, just depending on where I am with getting orders out in what I have going on in my own life. I made a really big effort to get completely caught up with my queue of orders before leaving, so I did not extend the processing time while I was gone because it was already at one to two weeks which gave me time to get orders shipped out once I returned. As you can see in the graph, I had almost $4,000 in orders during those nine days that I was away. And I only logged onto my computer to answer convos once during that time. My shop carried just as normal, and I was able to continue to build those sales, reviews, relevancy, and quality score within Etsy while I was cruising around the Caribbean with my family. If I had gone on vacation mode during that time, not only would it have completely eliminated the $4000 in sales that happened during the week that I was away, but it also would have slowed down my sales when I returned. The impact of that vacation would have stretched much longer just the week and a half that I was gone. So there you have it. My feelings about vacation mode and why I don't think you should use it in that way. I don't think that there's anything wrong with vacation mode when you have a major life circumstance that requires you to take some time away from you shop - in fact, that flexibility is one of the things that I love about being an Etsy entrepreneur, however I think that “vacation mode” is really a misnomer. It should be “emergency away” mode or “gotta deal with big things in my real life” mode. not vacation mode. 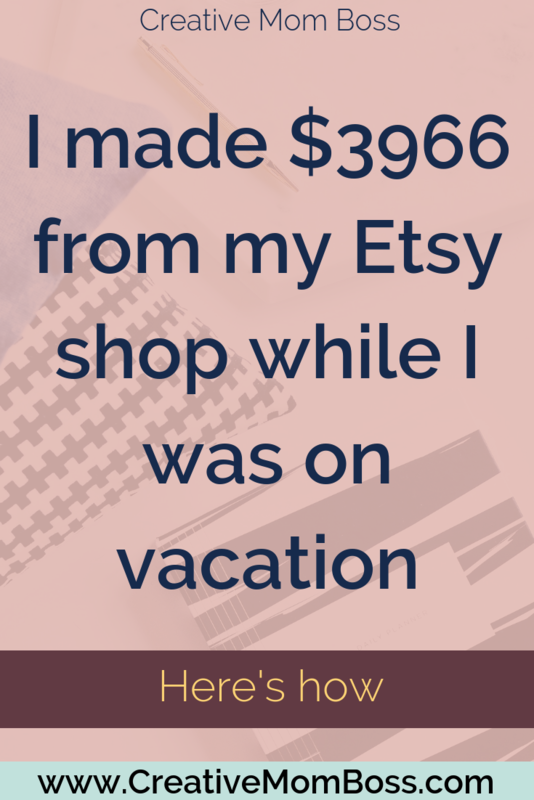 If you're just going on a normal vacation, your shop should be able to function in your absence and continue to bring in that income for you. I’d love to hear your thoughts - do you use vacation mode? Love it, hate it? Have you experienced slow sales after coming back from vacation mode or you’ve popped right back up with normal sales?